California Cliffs - Parkdean Resorts03443353754work Holiday ParkClose to the bright lights and seaside hustle and bustle of nearby Great Yarmouth, and just a 5 minute walk from the gloriously Scratby Beach, California Cliffs is the perfect base for a classic seaside holiday. 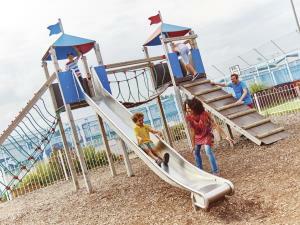 The park offers you a holiday filled with family fun, with a wide range of exciting facilities and activities. With everything from indoor and outdoor pools with twisting flume, go-karts, adventure playgrounds to the crazy golf course, there’s something for everyone to enjoy. After a fun-packed day, unwind watching fantastic entertainment in the restaurant and bar. If you can tear yourself away from the park’s facilities, you’ll find lots to do nearby from the attractions of Great Yarmouth to relaxing in the peaceful waterside villages and pubs of the beautiful Norfolk Broads. The park offers a range of self-catering accommodation, from superb and fully equipped caravan holiday homes to luxury lodges. Close to the bright lights and seaside hustle and bustle of nearby Great Yarmouth, and just a 5 minute walk from the gloriously Scratby Beach, California Cliffs is the perfect base for a classic seaside holiday. Freeview TV. Additional charges apply when booking pets; requesting high chairs and cots. Children welcome from any age. 4. This road continues into Jack Chase Way and Scratby road. At the crossroads, turn right onto California Road and left onto Rottenstone Lane with California Cliffs Holiday Park just ahead. The nearest bus stop is just outside of the park with the Coastal Clipper services 1B, 8, 200 and 271 running via Martham, Hemsby and Scratby. You are just 5 miles from Great Yarmouth train station, or a 12 minutes drive from California Cliffs. The main line from this station is Norwich via Acle once every hour. Norwich Airport is around 27 miles or a 45 minute drive away from California Cliffs. You can fly to Norwich from Manchester, Edinburgh, Aberdeen, Exeter via airlines such as Flybe, Loganair, British Airways and Eastern Airways. California Cliffs has 3 Gold Plus caravans suitable for wheelchair users 1 Silver Wide caravan suitable for wheelchair users 1 Bronze caravan suitable for wheelchair users Please telephone to book.